3,700+ Pages of Inspired IT! Discover the latest tools, tips, and best practices for scripting, monitoring, and network troubleshooting for Linux and Windows environments. 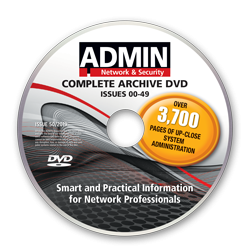 The ADMIN Archive DVD includes practical, hands-on tutorials on the tools and technologies of today's networks. ADMIN patrols the realm of the modern enterprise, with articles from the experts on automation, security, optimization, virtualization, containers, and cloud computing. The DVD will ship in April 2019. You will receive a confirmation email when the DVD has been sent.